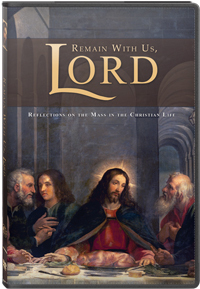 Remain with Us, Lord, is an inspirational collection of personal stories and theological reflections on the importance of the Sacrifice of the Holy Mass in our spiritual lives as Christians and the peace and happiness we draw from it to live our lives close to Jesus Christ and to bring him to others. Filmed in the United States and Ireland, the testimonies and reflections brought together in this special video will touch hearts and encourage reflection on the importance and meaning of the Mass in our own lives. The video runs 35 minutes and includes English and Spanish subtitles; the interviews featured in the video include Fr. Robert Barron, Archbishop Jose Gomez, Archbishop Charles Brown, priests and individuals from Illinois, California, and Ireland. For more information and to download the video, visit the website for the video: www.remainwithuslord.org.